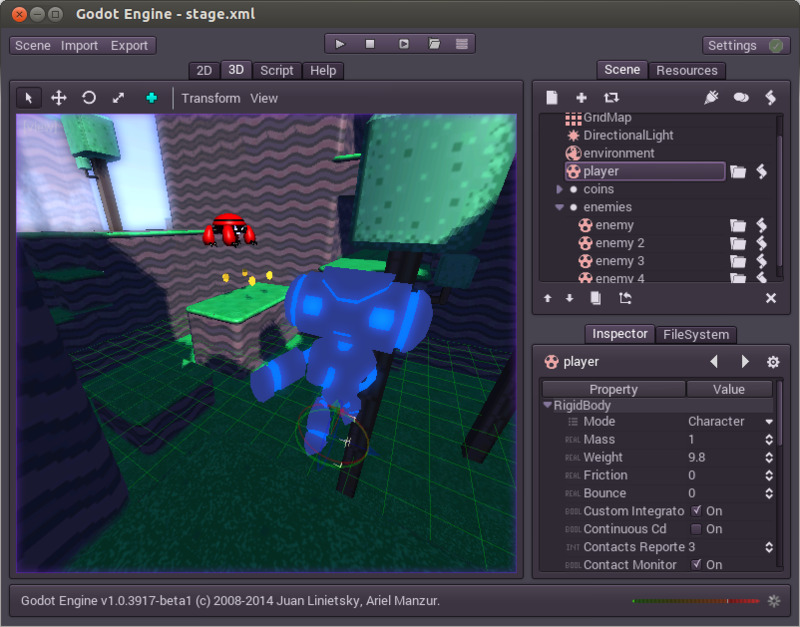 A game engine similair to Unity called Godot is going to be open sourced under an MIT license, this tool looks seriously promising. Quote Hi guys! I’ll be brief. We’ll be opening a game engine that has more than a decade of work (and several iterations) as MIT license soon. It’s not an engine made by hobbyists, this is a production tool used to develop and publish plenty of games for PC, Consoles and Mobile. It’s currently in beta stage, meaning it’s feature complete and fully usable, but lacks very little fine tuning and testing. It has a similar feature set to Unity (little less stuff on 3D front, much more stuff on the 2D front, debugging). and runs on all the popular desktop and mobile platforms, as well as on the web (through asm.js). 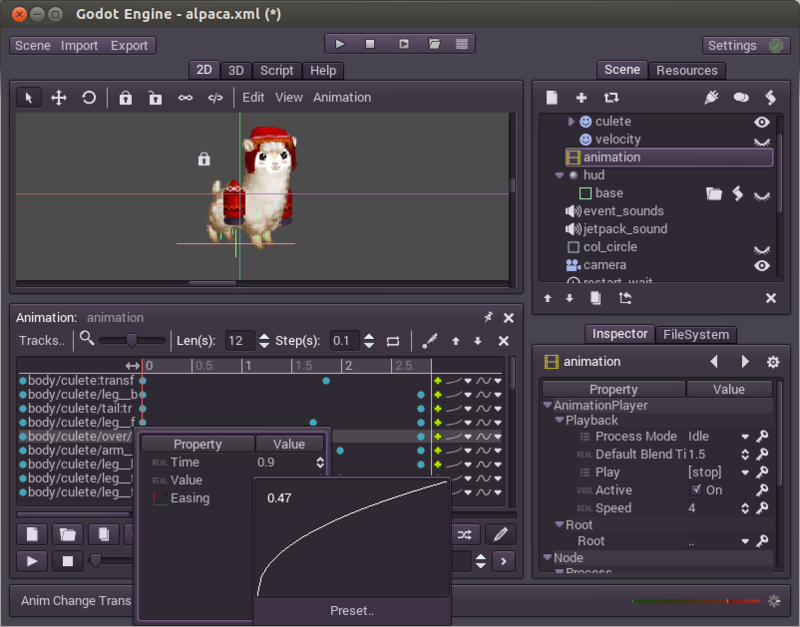 Unlike almost any other game engine with this level of features, the editor runs fine in Linux, as well as Windows and OSX, and supports one click deploy. So a production level game creation tool that runs on Linux and has a one click deploy feature like Unity, I hope this tool really picks up Steam as we could use an open source alternative. If you remember I highlighted the danger of relying on a single closed-source tool for game developers, so I hope this interests quite a few people. On the gamedev.net topic the author is asking for people to help out with testing the engine, looking for grammar mistakes and/or other problems. I dropped them an email as it seems extremely interesting. Hopefully this will allow more developers to switch to Linux as a development environment. Quote from Zapa On the gamedev.net topic the author is asking for people to help out with testing the engine, looking for grammar mistakes and/or other problems. I dropped them an email as it seems extremely interesting. Hopefully this will allow more developers to switch to Linux as a development environment. I've been using it for a couple days, not very much mind you, but looking at the tutorials and reference material on the wiki. I really like what I've seen! I sent an email last night with a couple little tweaks to make to language, but it's really the docs that need more input. I've requested access to edit them, but haven't heard back yet. It's been many years since I worked on game development, and I always did just 2D stuff from scratch (with SDL libraries, vim editor), no engine experience. This has me really excited, and it seems well thought-out. Currently the 3D stuff is geared towards GLES, but if the community forms, I expect it'll improve rapidly and dramatically. The whole thing is bringing back memories of when Blender opened up (I still remember the thermometer graph, haha). I even started the godot subreddit not long ago, in hopes that this whole thing takes off. Edit: the Torque 3D engine is also under the MIT license and I read that a Linux port it in the works, but it's been a slow road. 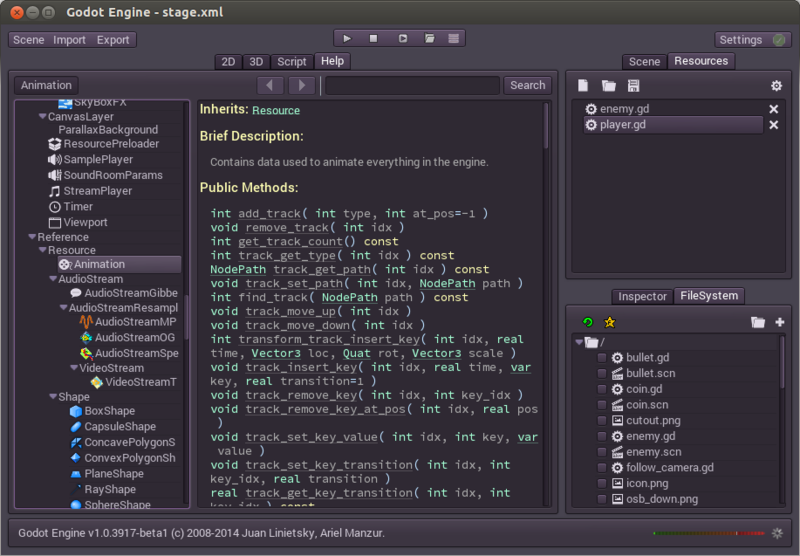 Godot looks better from what I've seen, anyhow. I do remember buying a few Linux games years ago made with one of the Torque engines, but I can't remember what they were off the top of my head. Also, if you have an Android device, search for "Anthill Lite" and try out that 2D game, which was made with Godot Engine. Subscribed to the reddit topic. I agree, documentation is extremely important and can make or brake a product. Hopefully it will be the first case here. Yaaaaay!!! I'm really looking forwards to this! I've been wanting to try some game development for quite a while.